Investors sold off copper on Wednesday as the US dollar strengthened and equity and bond market volatility spilled over onto commodity markets. Comex copper plunged more than 3% to a low of $3.085 a pound ($6,800 per tonne) in New York, an eight-week low. Volumes were particularly heavy, with more than 185,000 lots worth some $14.3 billion traded by the close. After a 30% jump in 2017, copper has now lost 6.5% of its value year-to-date. 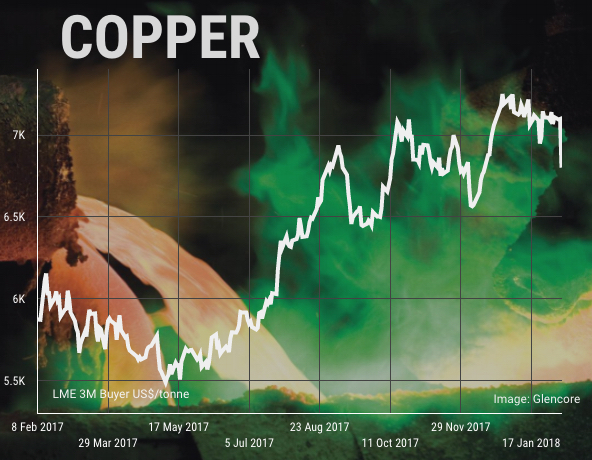 Given its widespread use in construction, transportation and power grid infrastructure copper is considered a good barometer of the world economy. With forecasts for the global economy pointing to 4% growth in 2018, demand for the metal should remain robust this year. “Instead of just focusing on the global growth outlook, which is positive, you should keep an eye on what we call China’s old economy"
A research note from Capital Economics points out that large-scale speculators in copper futures and options such as hedge funds have become more cautious about the outlook for the bellwether metal. 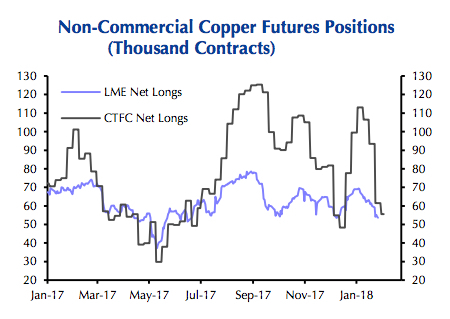 Net long positions – bets that copper will be more expensive in future – on the Comex market in New York and on the London Metal Exchange have been slashed since the start of the year. “China’s property sector consumes more copper than the U.S. alone,” he said. Other industrial metals were also punished on Monday with lead tumbling 4.4% to $2,507 a tonne on the LME, the lowest this year. Last week, the battery metal hit its highest since July 2011 at $2,885. Zinc retreated further from decade highs hit in January to trade at $3,380 a tonne. Nickel lost 1.6% to $13,175 a tonne.